Discussion in 'Streetwear and Denim' started by Drinkwaters, Feb 28, 2007. Quick question. When did EG change their label from the one below? Or have I misunderstood things and they are still using it? Nice fit! Love those Ghurkas, I wish they weren't so slim or I'd have a pair. I love that homespun Bedford too, one of my favorite Bedfords that I own. That season had some really good stuff. I'm sorry I'm sure it's been discussed before previously but my search skills are lacking. Is anyone able to link to sizing advise for an EG newb? Specifically the Bedfords? They haven't used that label after that? Any garment with the white label is from before 2013? 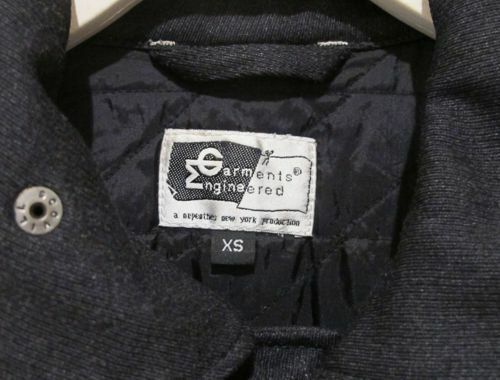 The newer label that just reads ENGINEERED GARMENTS can be in white or black. White is the SS season, and the black tag is for FW. The tag you included in your post is only in white from what I've seen and is for 2012 and earlier seasons. Bedford sizing is "different" every season, meaning that they all have different measurements. That being said, you should just order TTS since that's what Daiki wants you to do. I wear a Large across the board and have only had problems maybe once or twice. I'd agree. All of mine are TTS too. I like mine to fit slimmer. Depending on the fabric or season, you might have size up or down to get the fit you like. Also, as a tragic addendum to what falgfalg said, chubbiness due to recent marriage (damn you marriage!) can also throw a wrench in intended fit. The difference between sizes is usually an inch in the p2p measurement. There are a crap-ton of $600 coats from Asian sellers, and they are mostly older label and very tiny. (Source: I’ve looked at all the auctions in despair). Alao, as a tragic addendum to what falgfalg said, chubbiness due to recent marriage (damn you marriage!) can also throw a wrench in intended fit. Yeah I hear you. That's why I thought it odd to see 19" pit to pit. I'm used to at least a 20" p2p on tailored clothing and expected at least that for the slouchy EG vibes I was seeing. TTS for me is a medium, and I’ve always sized to large up on bedfords until this FW when the sizing changed. So what do you guys think of the Loiter jacket? I snagged one for super cheap, sized down one (the chest is still an inch bigger all around), and can’t really tell what to think about it. I’m hoping it will look better/more EG-ish after I lose some weight. Right now it just sort of looks like clothes?